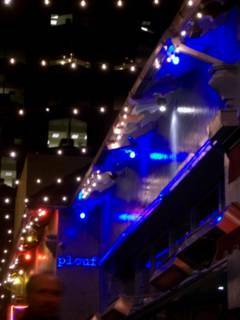 Last night I dined at Plouf where we eat regularly. The specials sounded so good, I chose them over regular favourites from the menu. I started with a lobster bisque. The soup was delicious but it didn't taste of lobster. It had a rich taste even though it wasn't a creamy soup. I puzzled over every spoonful but I couldn't work out the ingredients of what I was eating. For my main course, the special was skate on a bed of puy lentils. The fish, which was deboned, was glistening, fresh, soft and succulent. Really good. It was on a very savoury bed of lentils which had been cooked with bacon and winter vegetables. Tasty as this accompaniment was, it was subtle enough not to overpower the delicate fish. I visit Plouf every couple of weeks. It's one of my favourite restaurants, partly for the food but mainly for the atmosphere. I have been there so many times that I have got to know the staff and that always ensures I have a good time. Because I go there so often, I get to know the menu pretty well so I was excited to find they had changed their menu on my last visit. First the bad news: The Polenta salad they had had, with a smokey tomato sauce and the softest, creamiest pillow of polenta served with a bed of shiny dressed green leaves was not longer an option. This saddened me: the salad was an addiction of mine, and I knew I would miss it. I loved their old tuna tartare as well, but was excited to try the new version which was served on a bed of seaweed salad with pickled lemons. It was beautifully presented with the freshest looking tuna sliced in several glistening slices, resting on the japanese greens, swirled with an orange oil that I soon discovered was chilli. This dish disappointed me. In the first mouthful it was bland and I had to add salt to draw out the flavours. Then the mix of three strong tastes - the chilli oil, the bitter chunks of lemon rind and the crunchy seaweed salad all completely overpowered the delicate tuna which should have been center stage. Instead the three stronger elements fought it out for main attention, none of them exactly winning the battle, but all of them damaging the impact of the other in some way. F's goat cheese and heirloom salad was far more satisfying with a good tasty cheese, well selected ripened tomatoes and well dressed green leaves with a banyuls vinaigrette. For our main courses F took the new york steak which was served with a potato gratin and rich dark sauce. The steak was absolute perfection, well cooked to the medium rare requested, hot and a very tasty piece of meat. It paired well with the sauce which contrasted perfectly with the white creamy potato gratin which wasn't the best of potato gratins, but was quite adequate and provided some comforting carbs to the meal too. I tried another new addition to the meat menu - a duo of lamb dish. I ordered the lamb rare. It came with two rolled pieces of leg of lamb that were disappointingly stone cold, and two lamb meatballs that were a little warmer but not exactly hot. These were served on a bed of fresh chick peas and cucumber and yohurt. The whole dish was drizzled in mint pesto. Being English, I am more than familiar with the concept of lamb and mint, I grew up with it and I generally love it. This dish, however was totally overpowered by the mint. Everything tasted of it: the lamb, the chickpeas, the cucumber, everything. There was no contrast to that mint taste so the dish quickly became boring and I only finished half of it. The lamb meatballs had a little more flavour and managed to venture out slightly from under the mint ummbrella, but as they were cooling down, and not as hot as they maybe should have been, the taste of the fat in them became a little bit more dominant than I would have liked. I passed my comments on to the manager, so hopefully he'll act upon my suggestions and improve the two dishes we didn't like so much. Otherwise, if you pay a visit soon, I would recommend the steak over the lamb, or stick to the delicious steaming bowls of mussels and clams which are always excellent whenever I have them.